UK Representative, Chris Carnegy, deputised for the Chief Islander at the annual meeting and associated events. On 13th and 14th June 2018, I deputised for Chief Islander Ian Lavarello at series of meetings held in London. 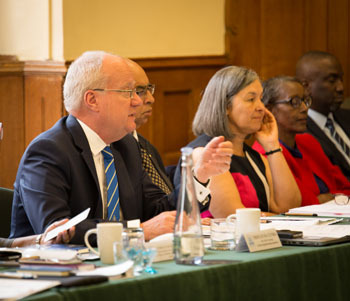 The UK Overseas Territories Association gathered at Church House in Westminster on the 13th, to lay plans for the main annual Conference between OTs and the UK Government that will take place in November. 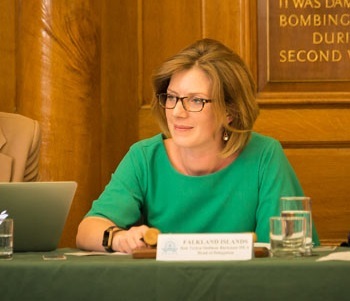 This year's meeting was chaired by Falklands MLA Teslyn Barkman, and provided a forum where OTs could develop their joint positions on key issues. Chris Carnegy speaking at the UKOTA planning meeting. President of the UKOTA Political Council, Teslyn Barkman. The UK Parliament had just moved to over-rule some OTs’ local legislatures. This related to financial services but the constitutional precedent was important for all OTs. 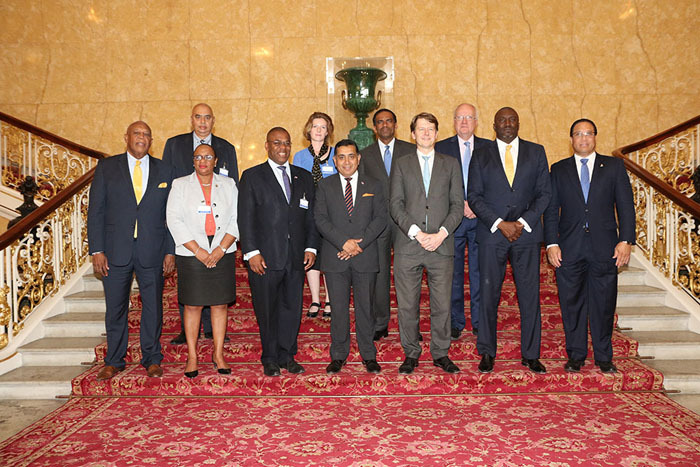 A conference at Lancaster House on the 14th, hosted by Overseas Territories minister Lord Ahmad, gave me the chance to convey a clear message from Tristan da Cunha: standing for office in small islands is a demanding thing to do, and OT politicians should only be countermanded from London when it is absolutely necessary. 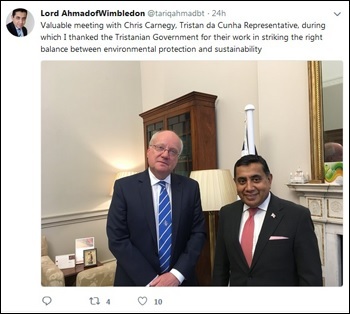 Lord Ahmad tweets about his meeting with Chris Carnegy. 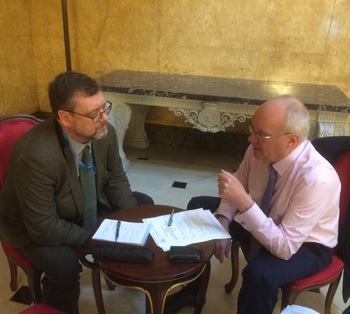 Catching up with Tristan's Desk Officer Mark McGuiness. I was also granted a private meeting with Lord Ahmad, and updated him on the Blue Belt process towards fresh protection for Tristan's vast ocean zone. It was good to see him tweet about our determination to combine a healthy and sustainable local economy with stewardship of the pristine South Atlantic. As well as the constitutional issue, the second day focused on Brexit. The European Development Fund has been a staunch ally of Tristan, backing key infrastructure projects like the electricity network. It was good to hear our latest bid has been approved and is unaffected by Brexit, but we also want continued access to the EDF or an equivalent for the future. The UK is also under no illusion about how Tristan values our free access to the Single Market; getting the best price for premium lobster means having access to premium consumers. Our voice has been heard: one official told me "you may be small, but Tristan features in every Brexit report I write"! 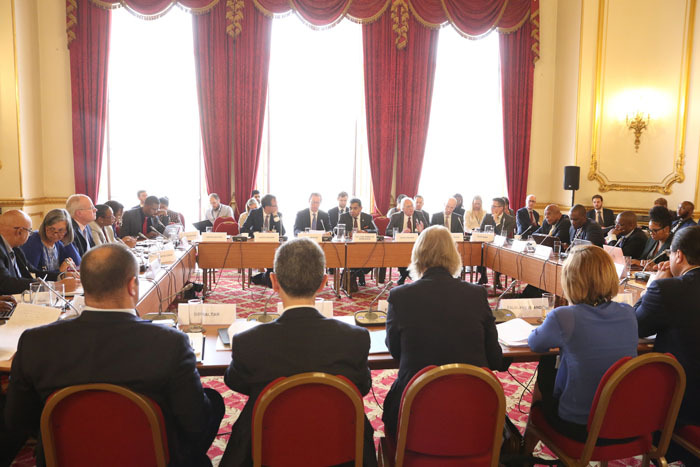 The Overseas Territories' Joint Ministerial Council in progress at Lancaster House, London.